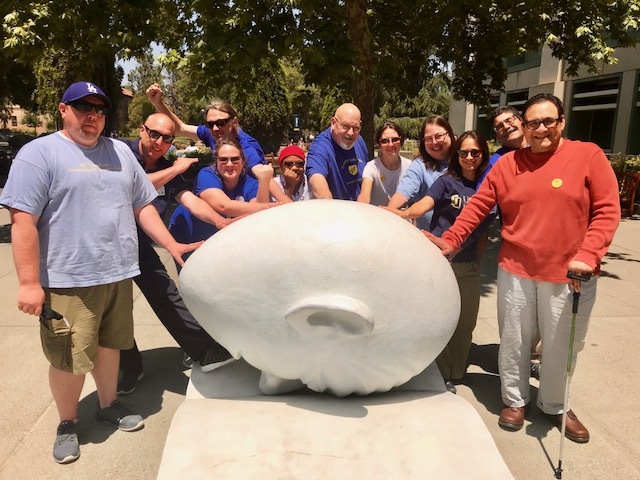 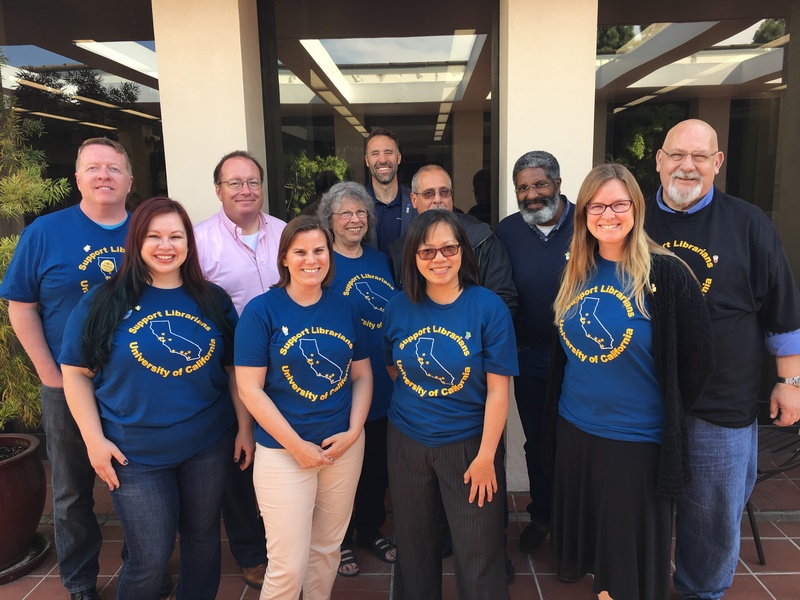 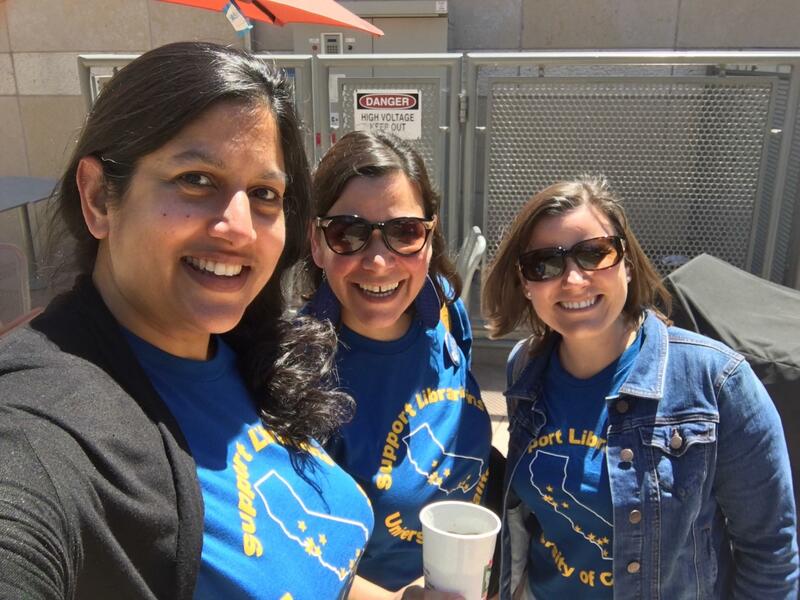 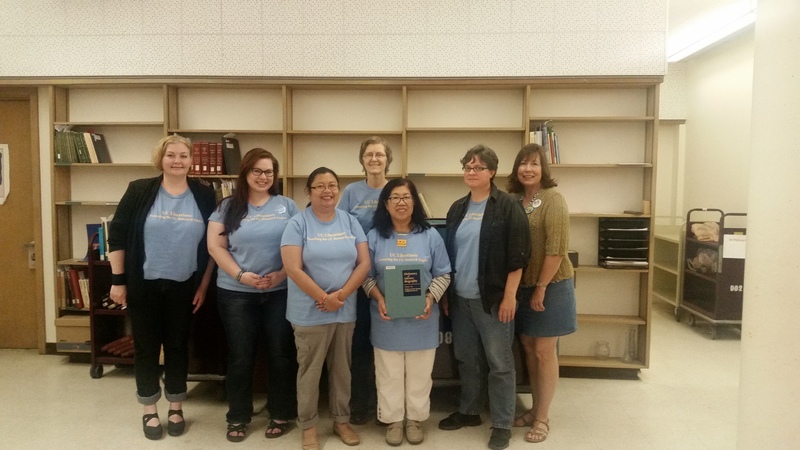 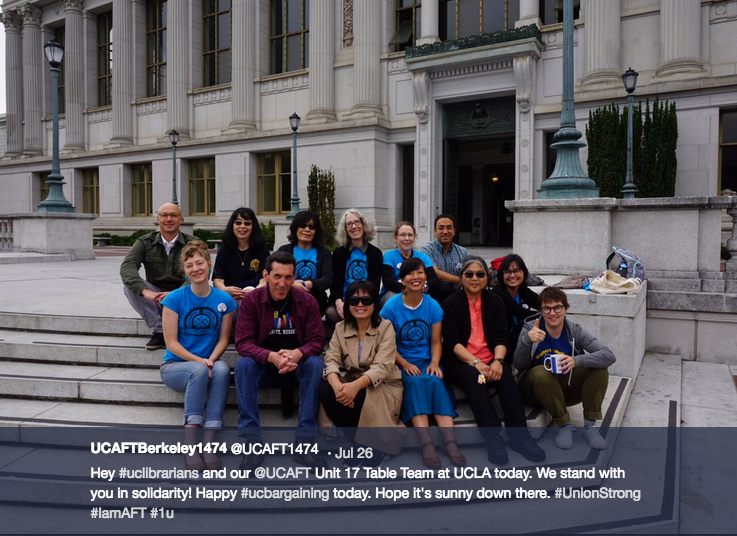 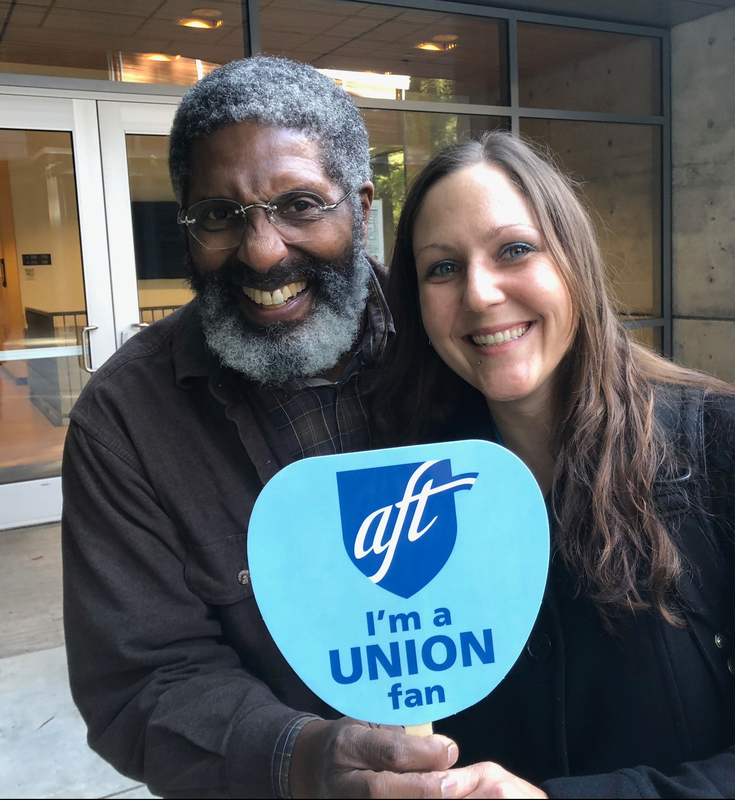 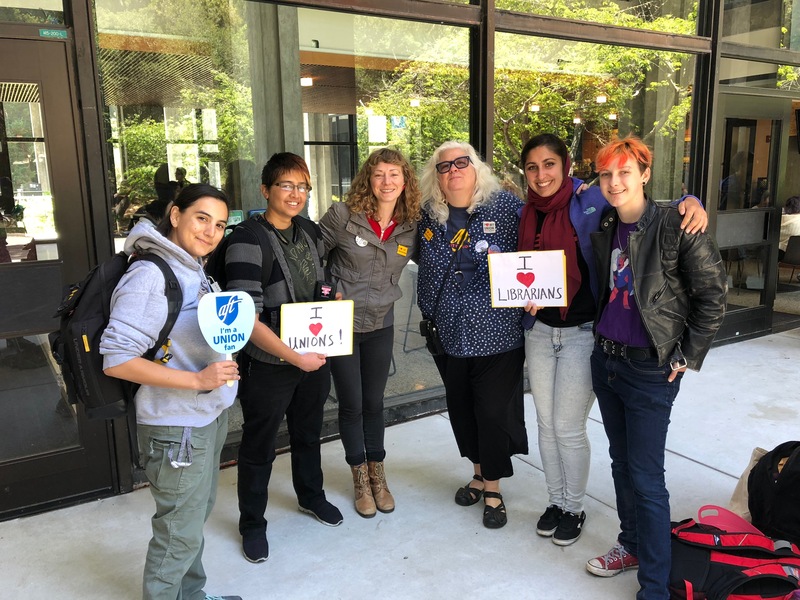 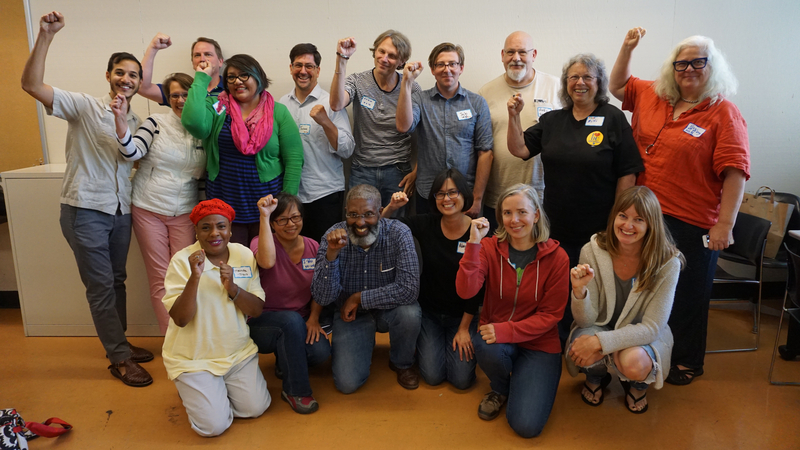 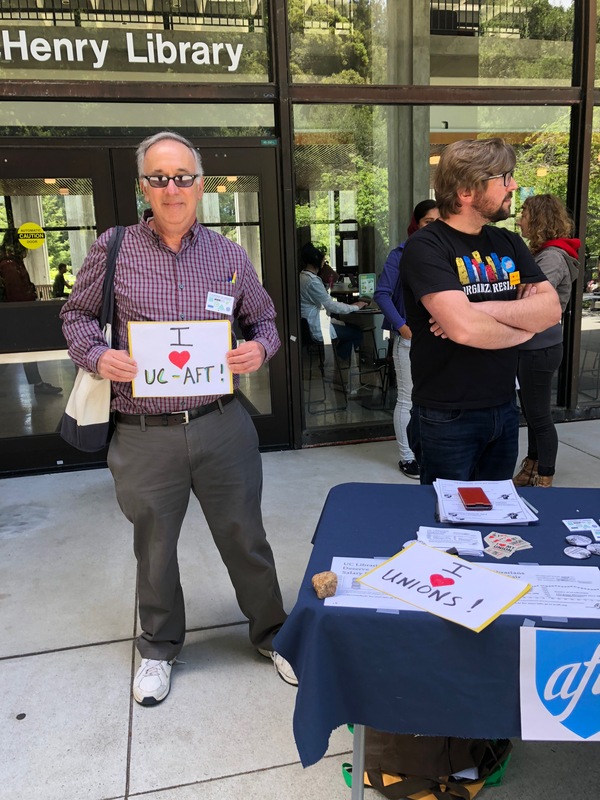 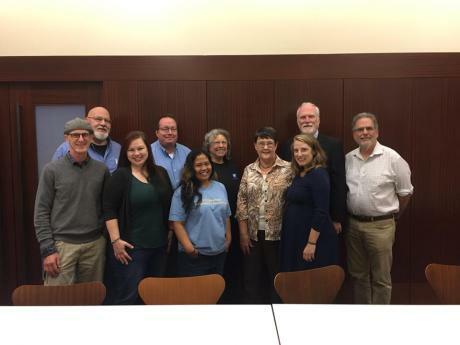 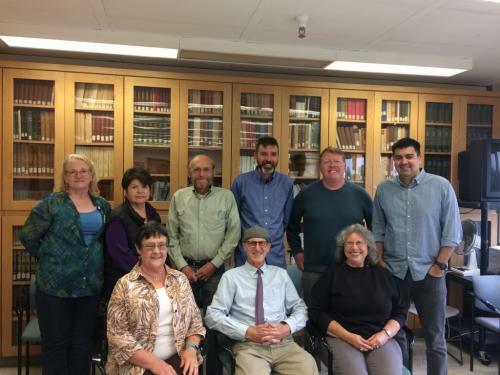 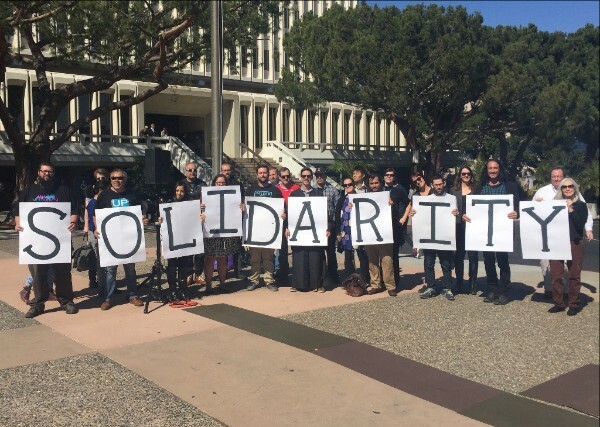 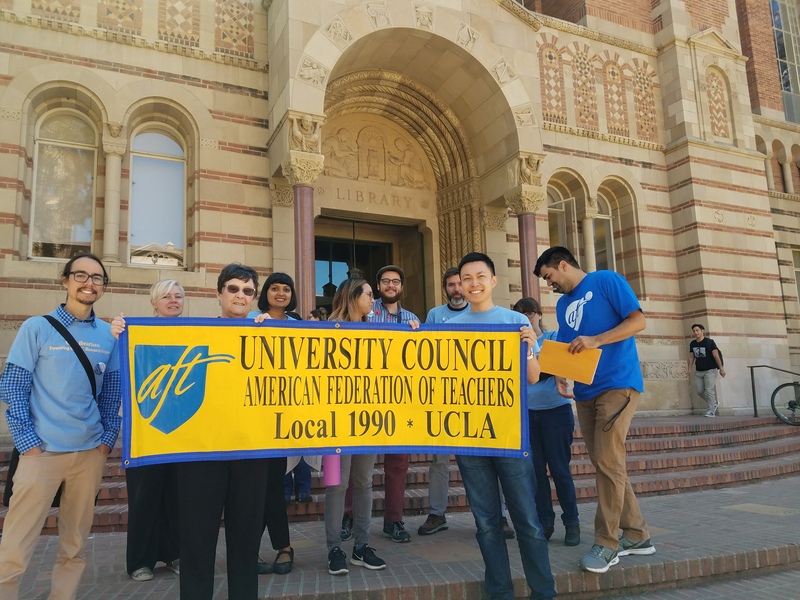 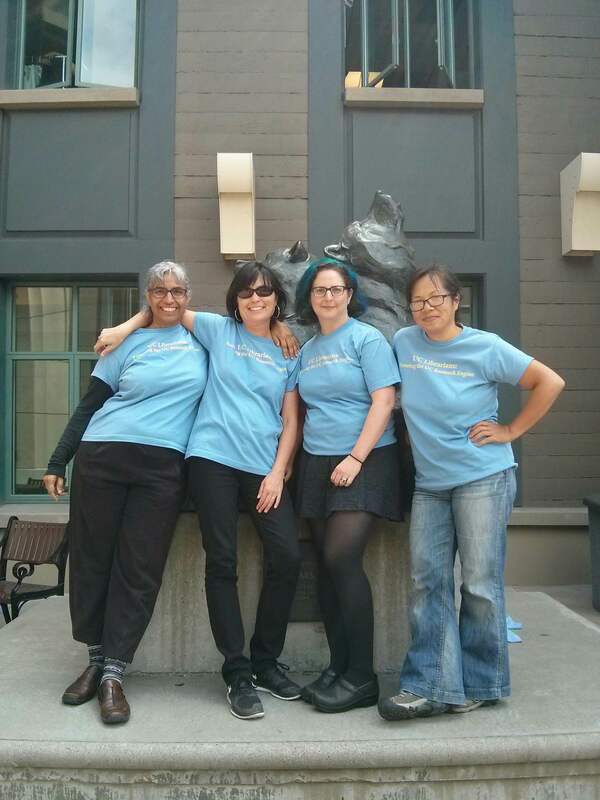 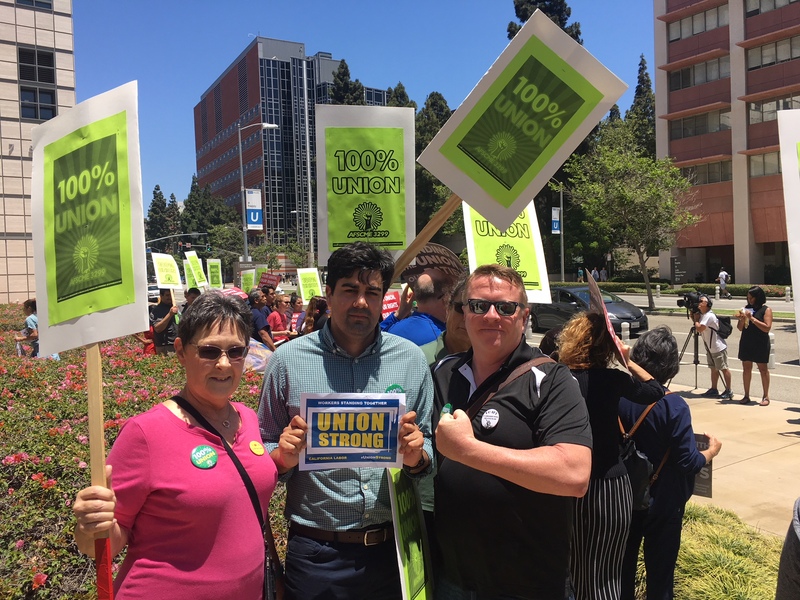 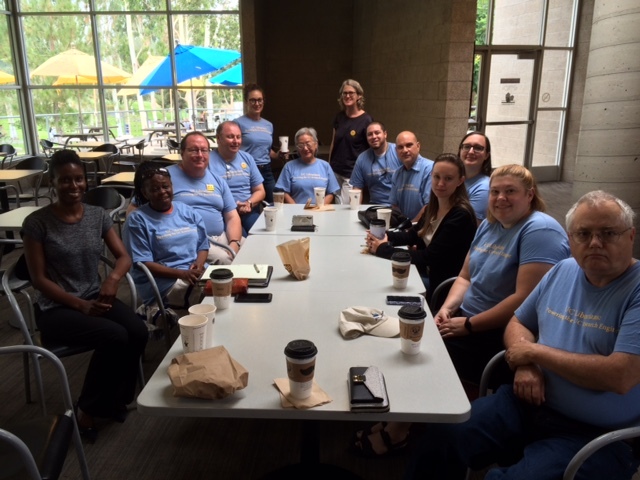 UC-AFT’s librarian bargaining team met with UC administrators in Oakland on July 6. 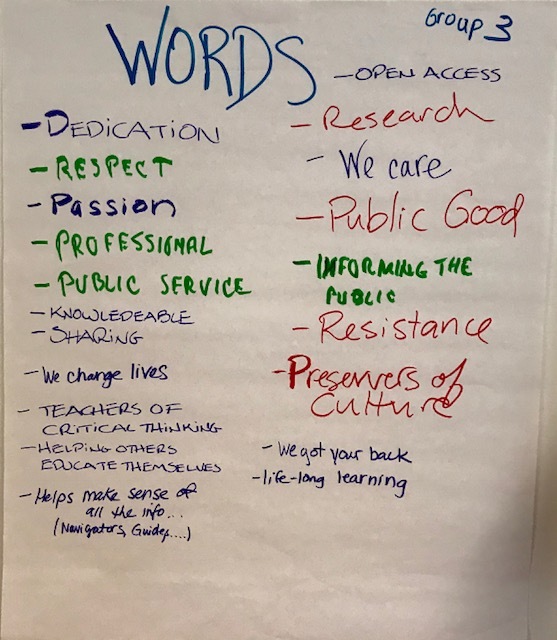 This was the first session since May 24 when our team passed proposals on Salary and Professional Development funding. 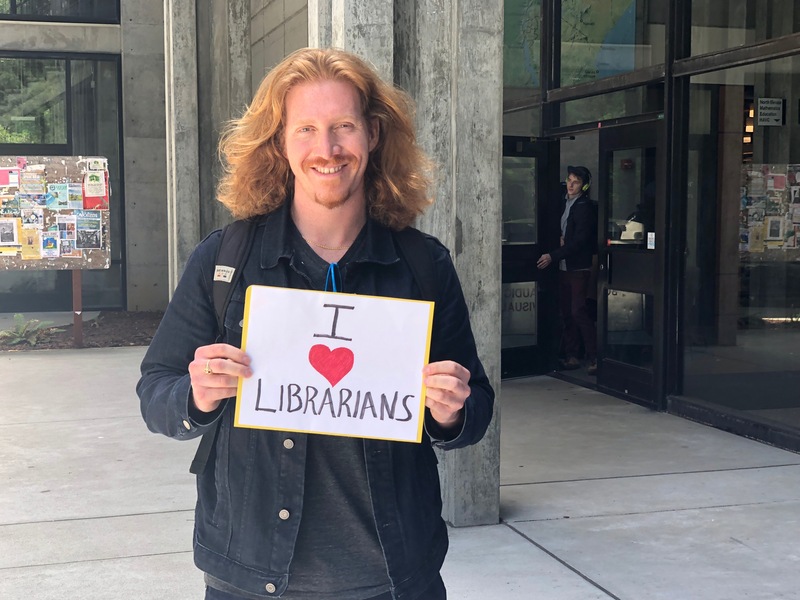 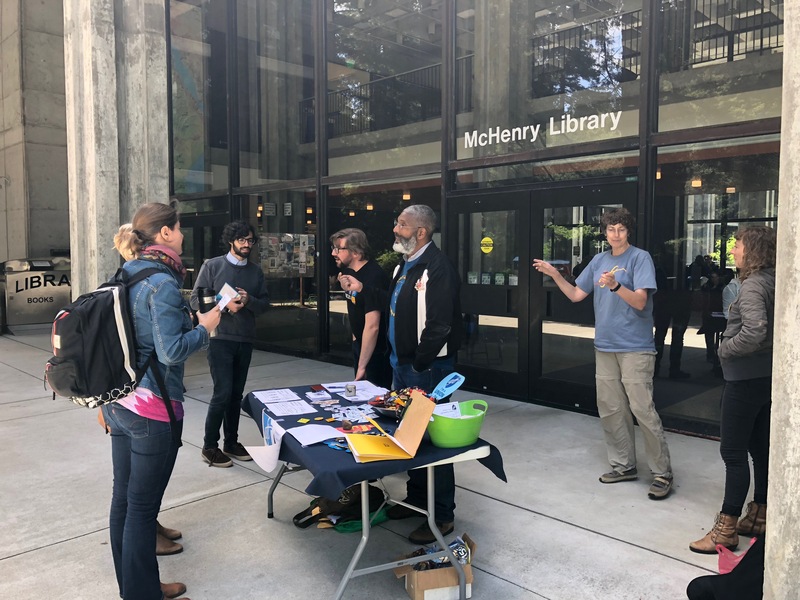 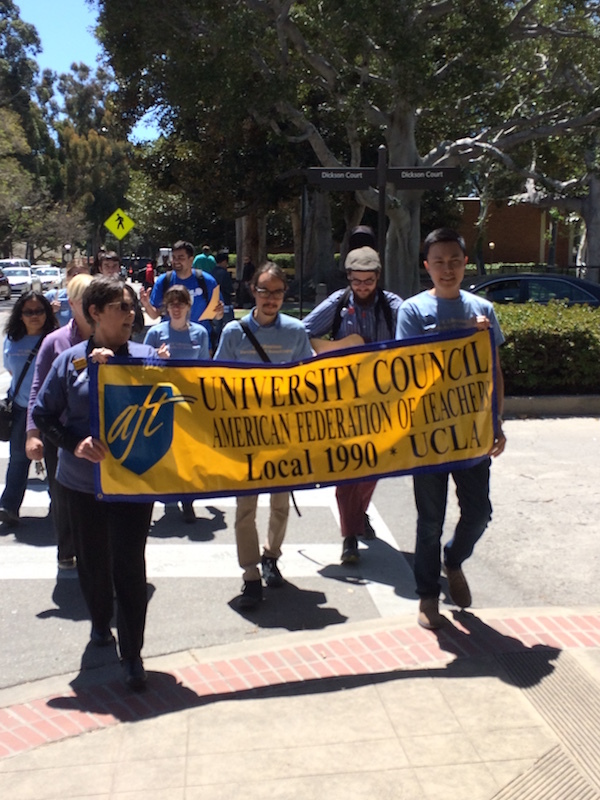 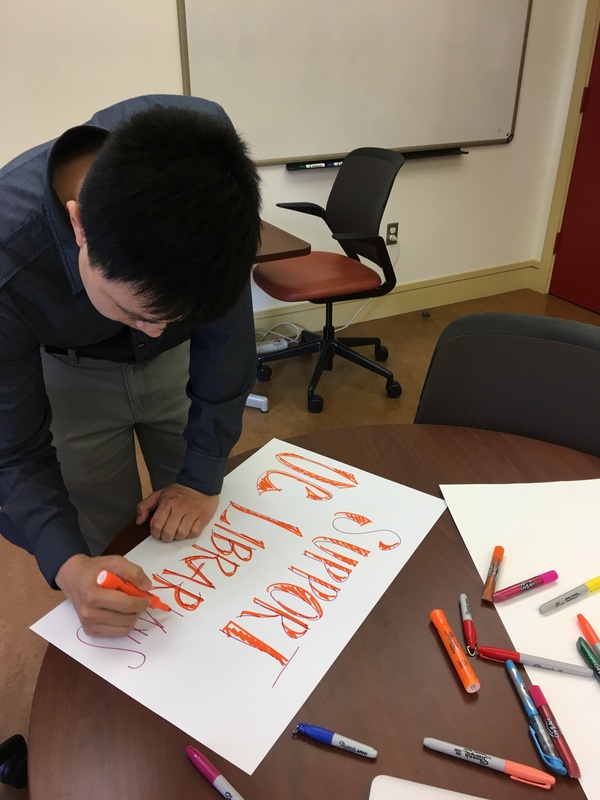 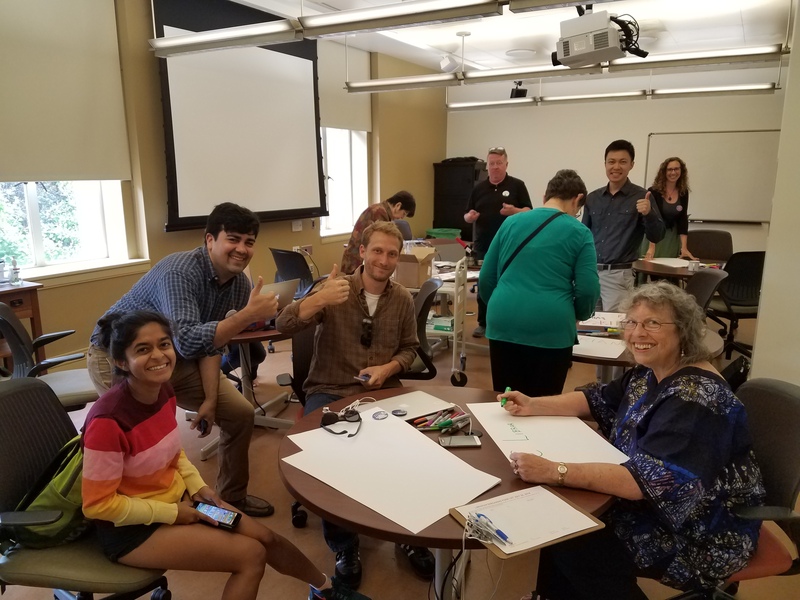 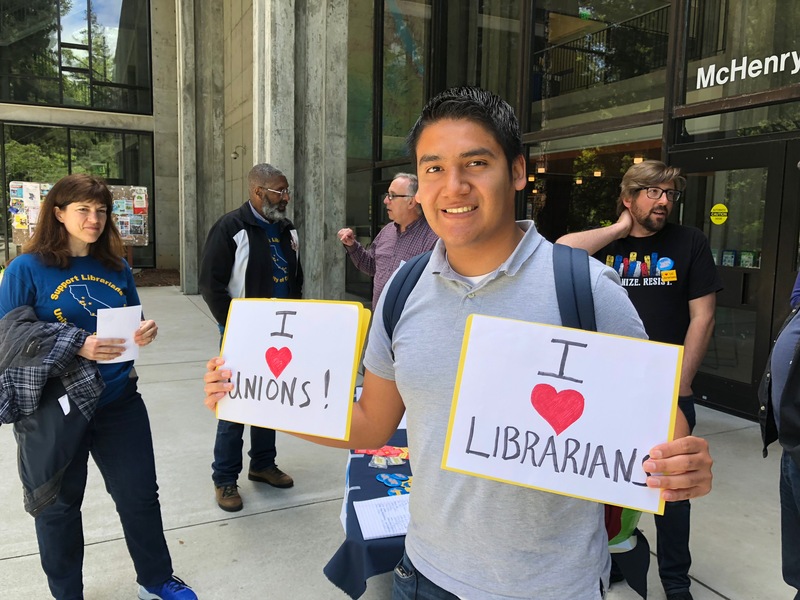 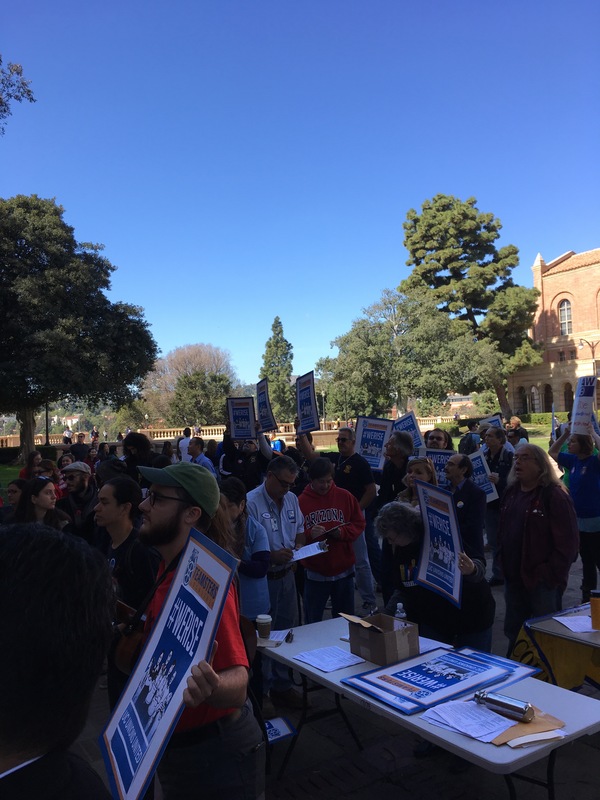 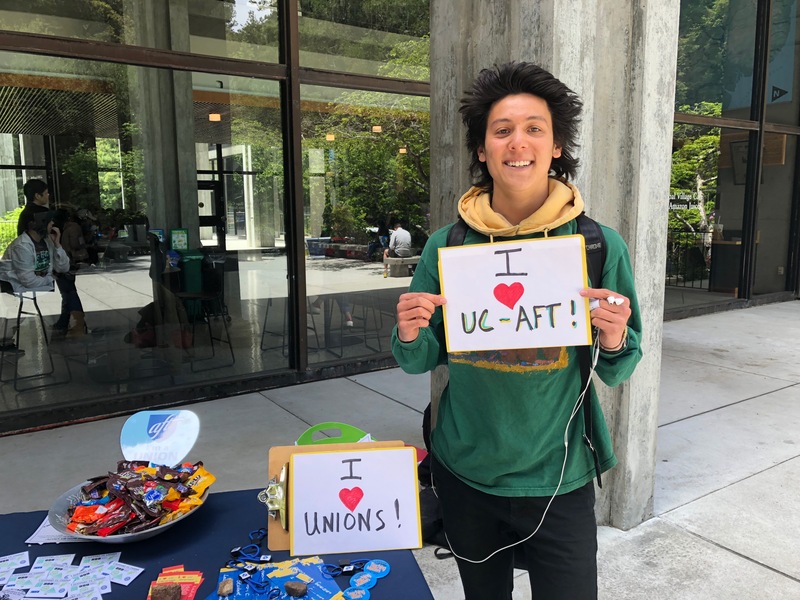 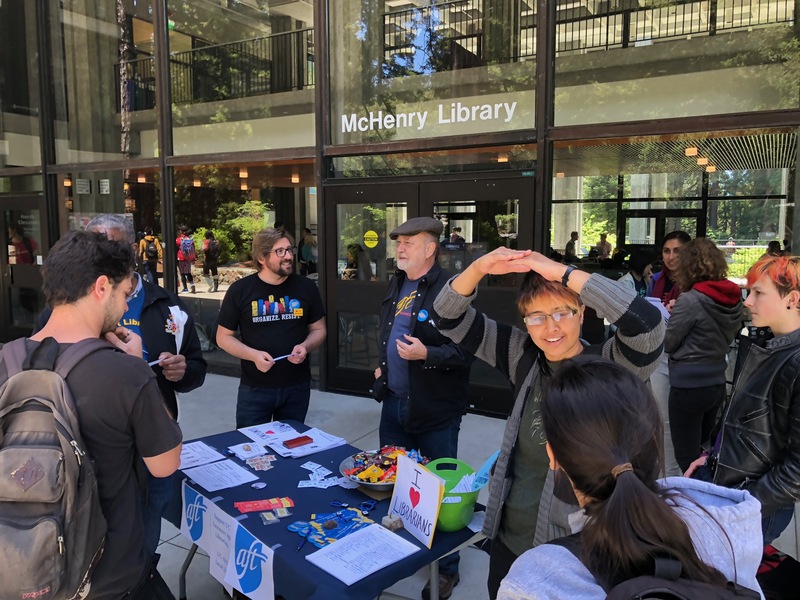 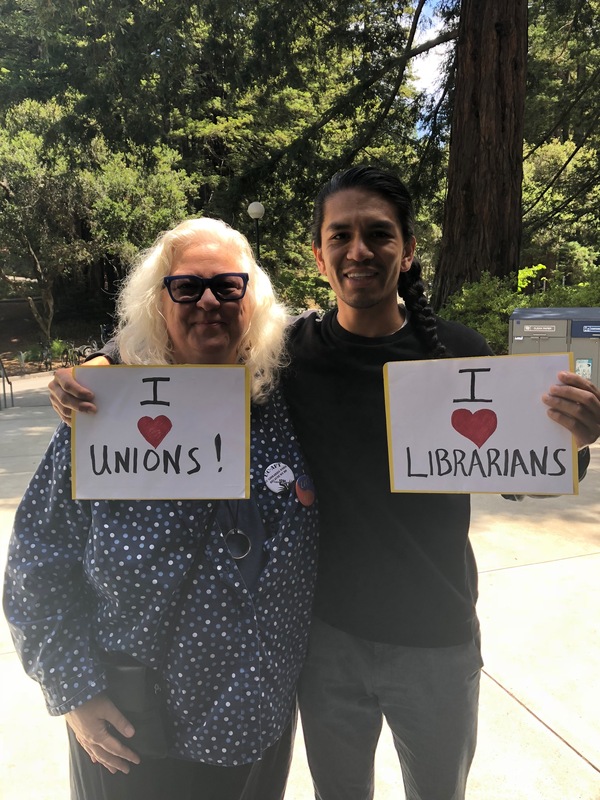 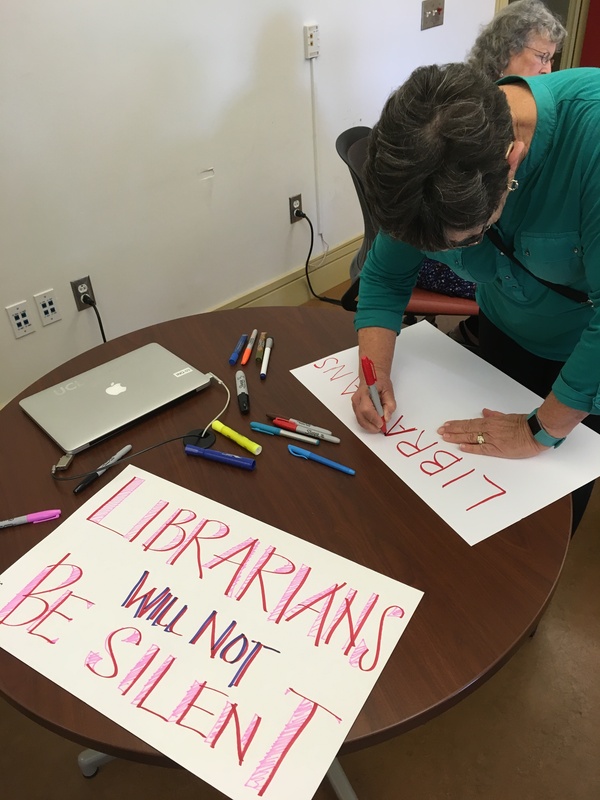 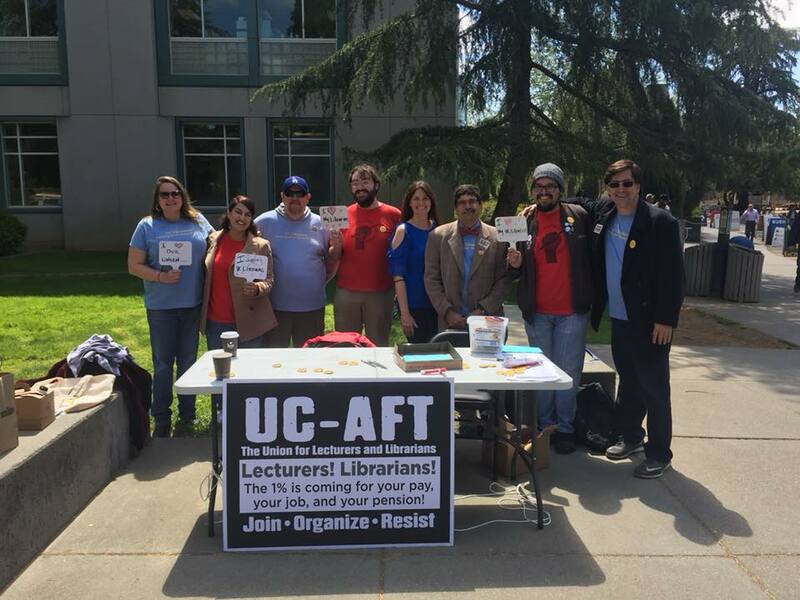 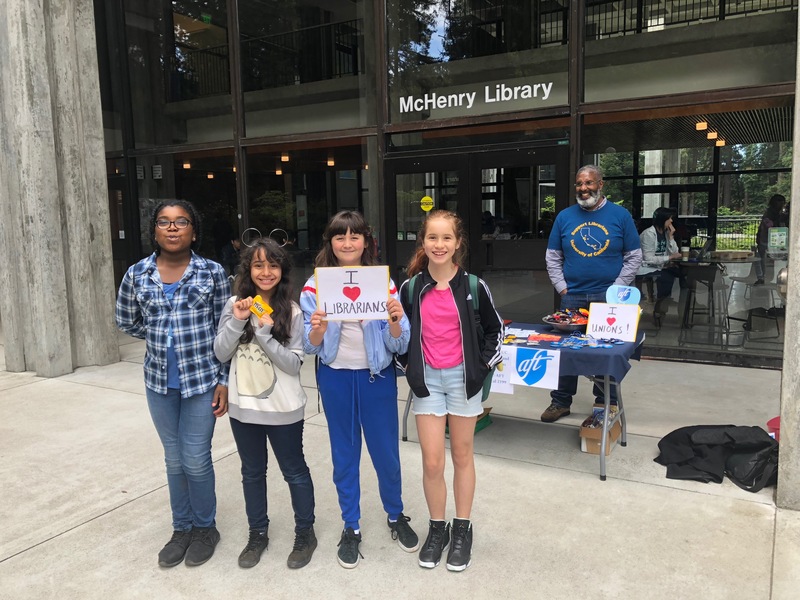 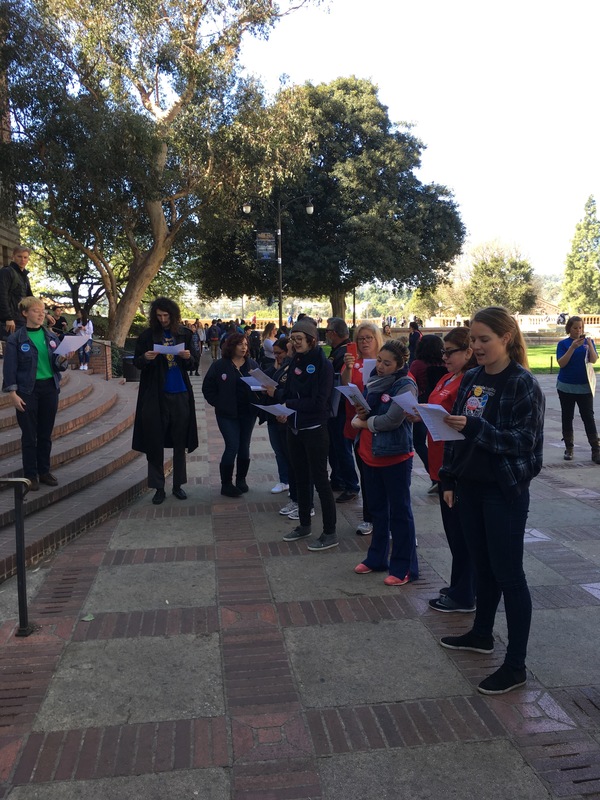 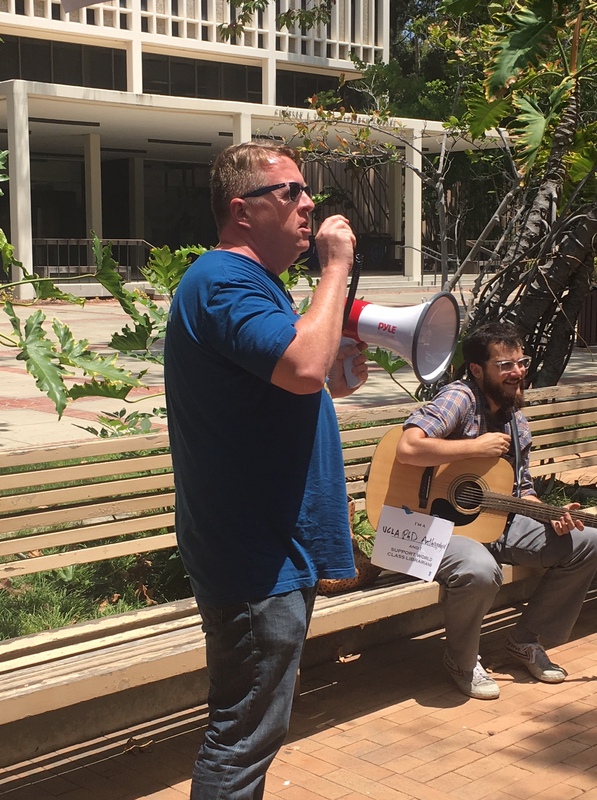 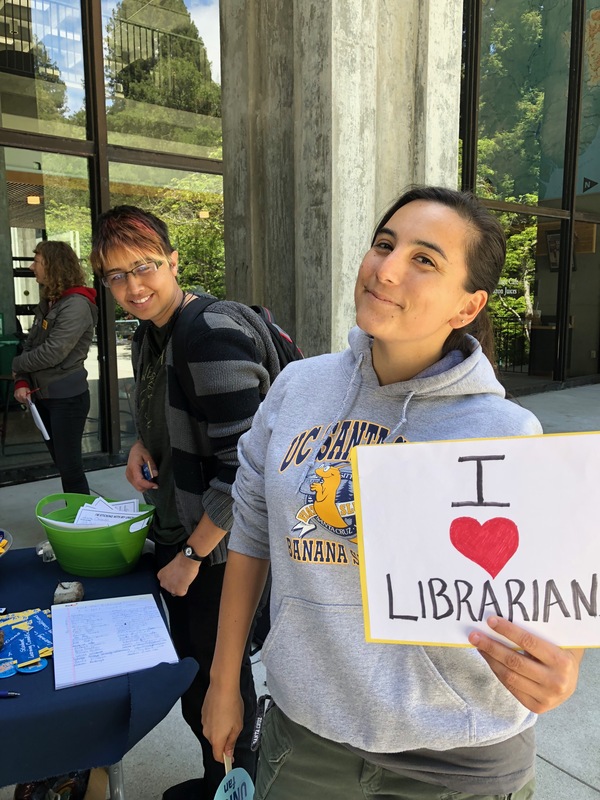 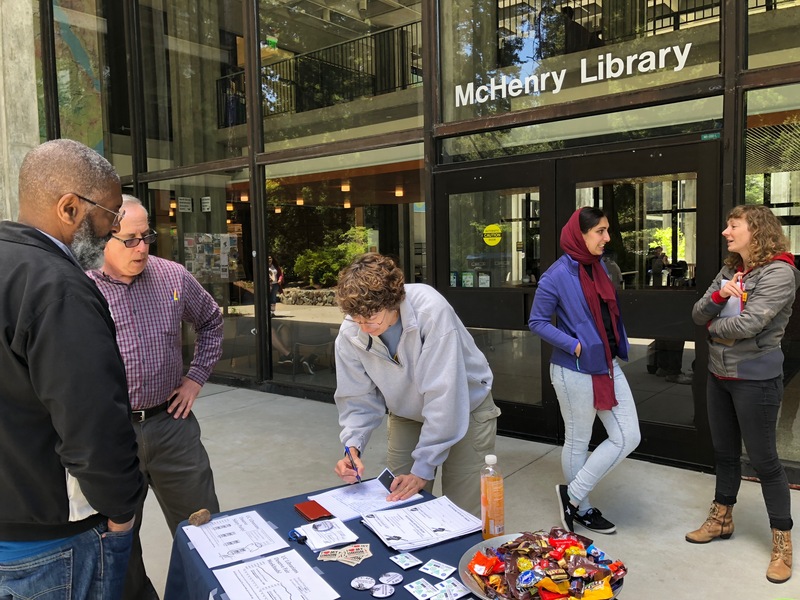 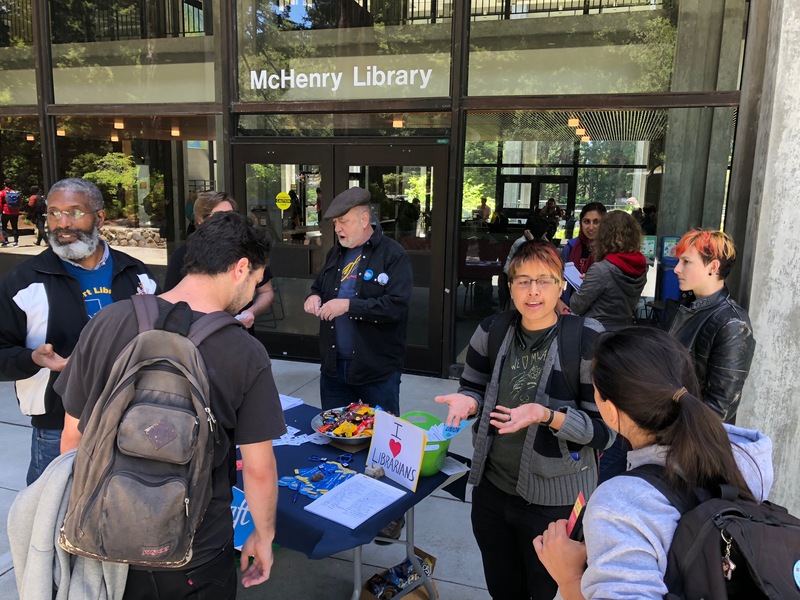 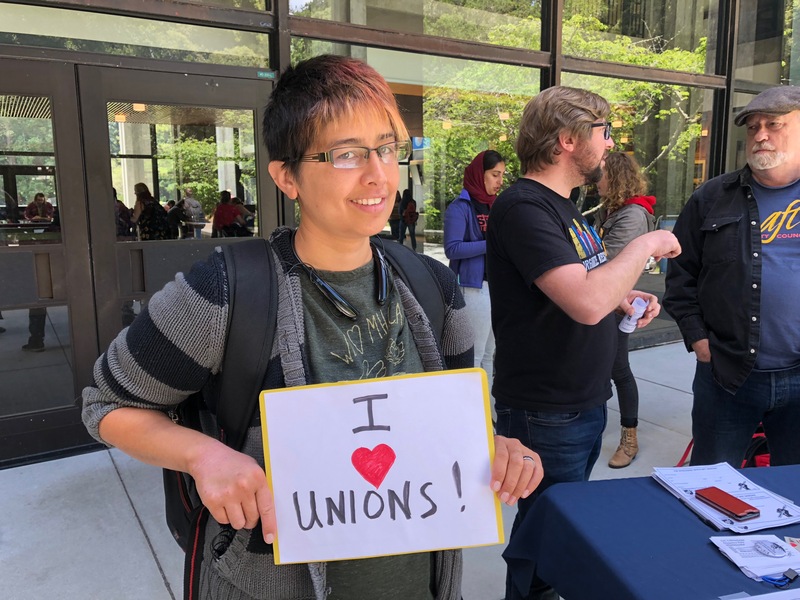 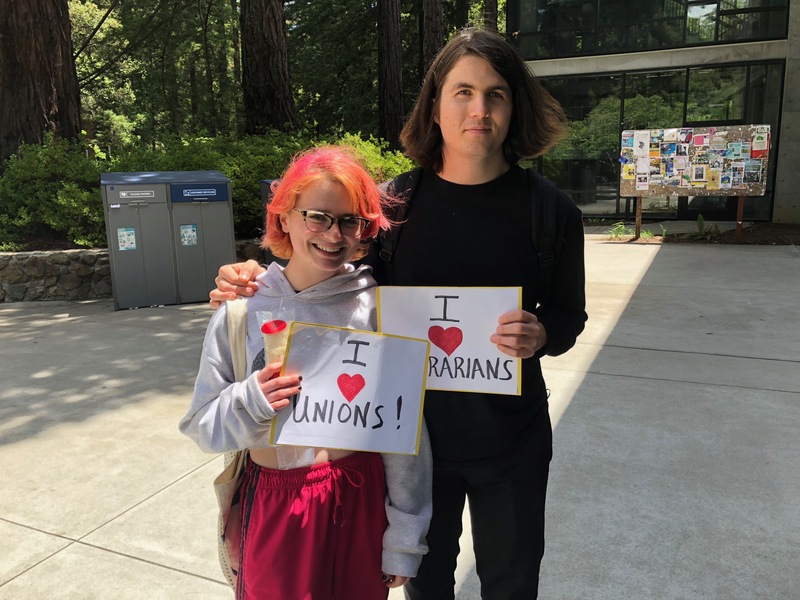 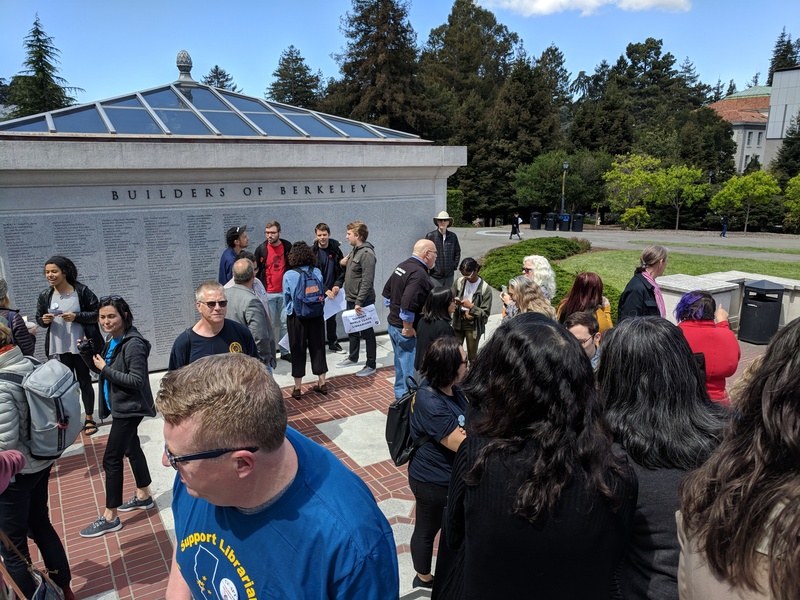 UC librarian salaries lag significantly behind librarian salaries at other local, state and private institutions in California. 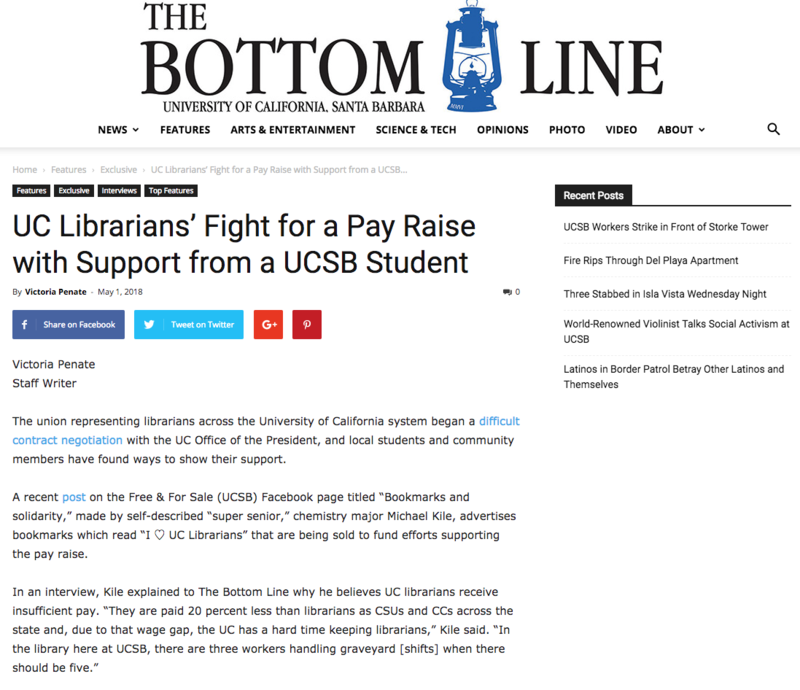 Professional Development funding for librarians is inadequate and levels vary from campus to campus. 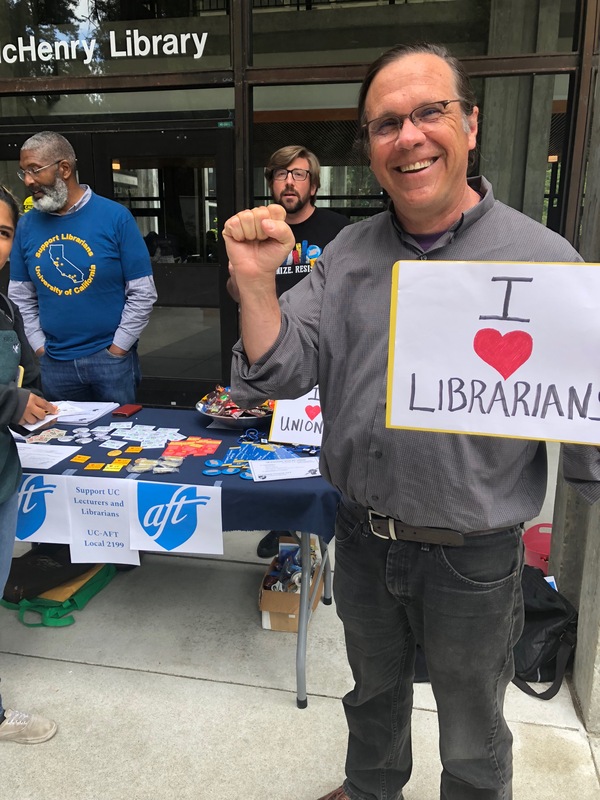 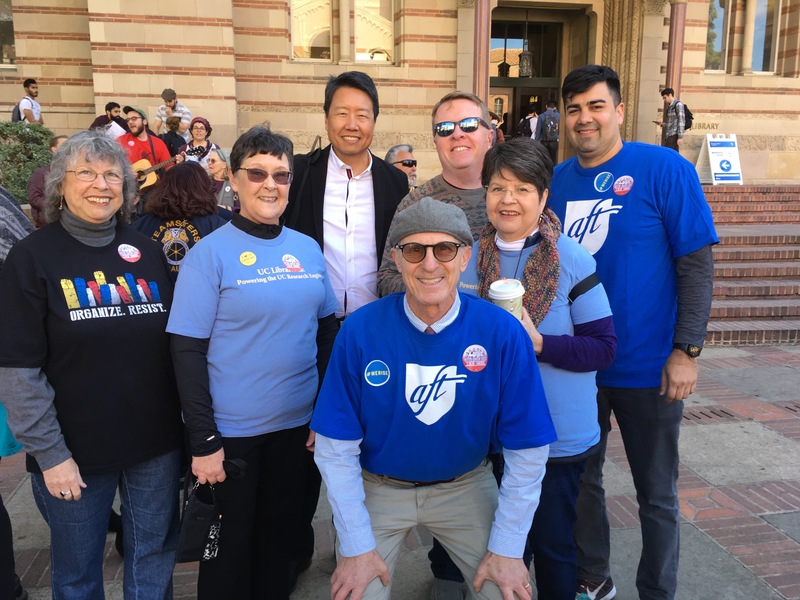 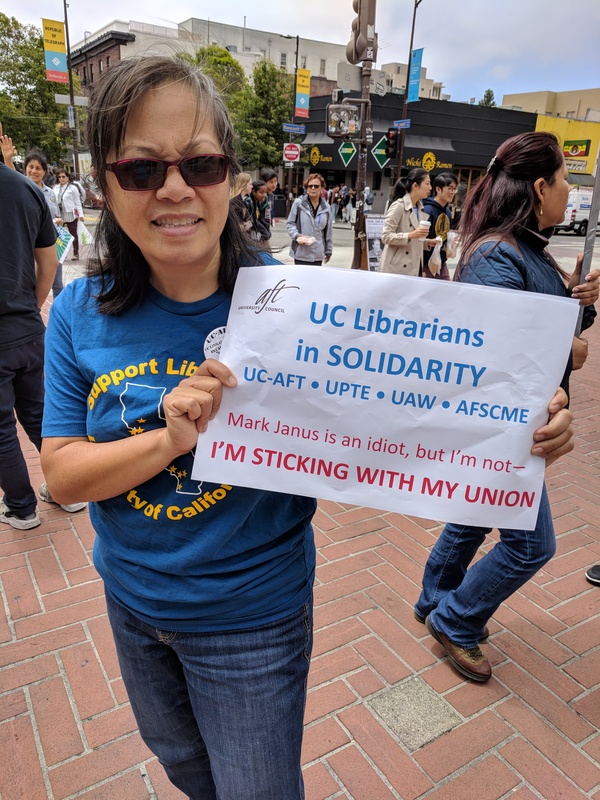 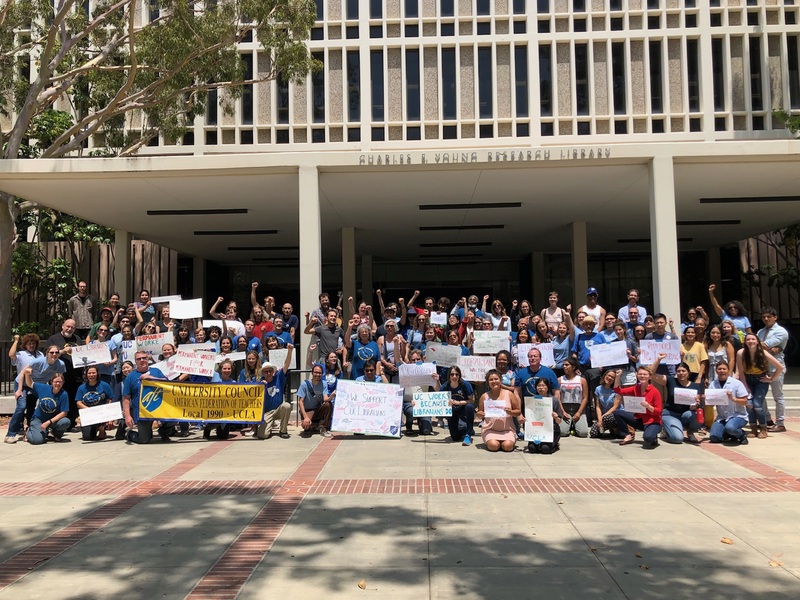 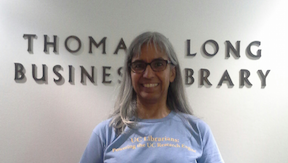 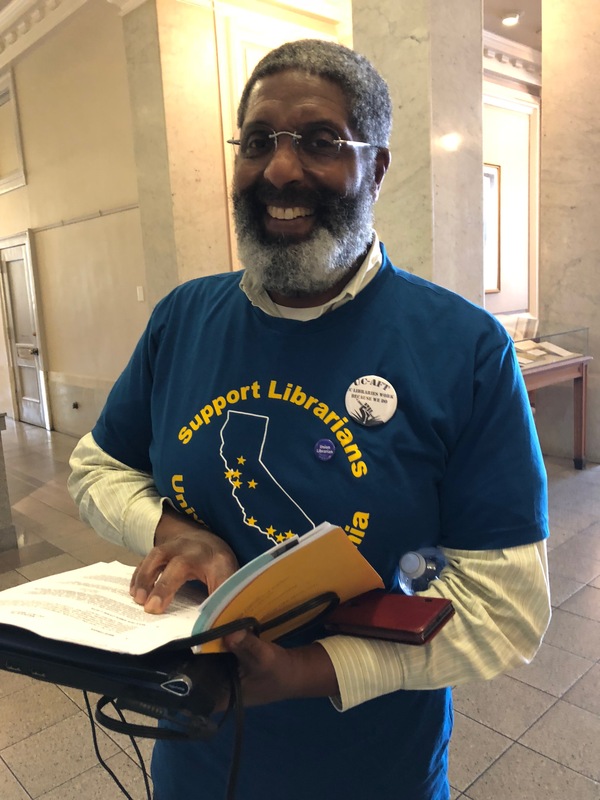 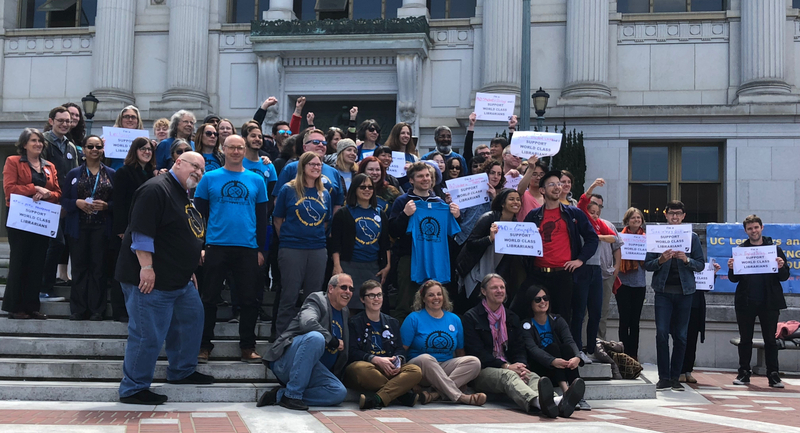 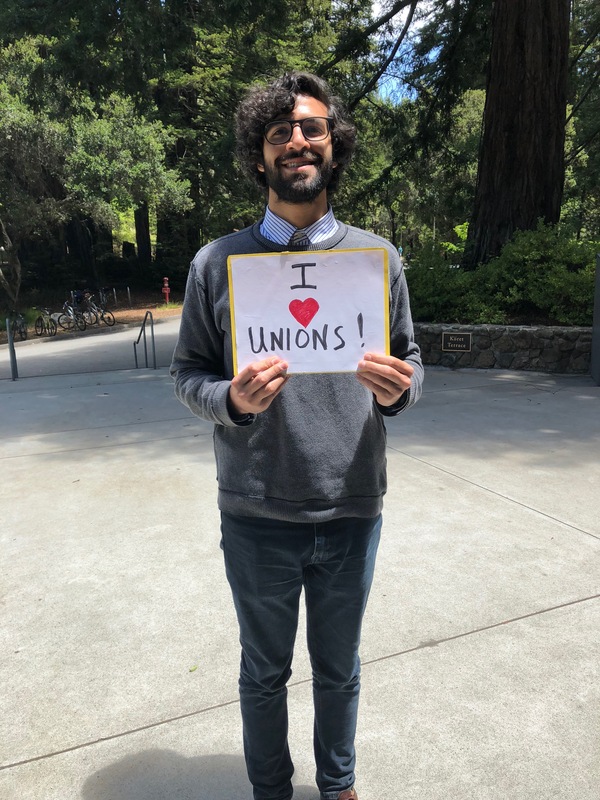 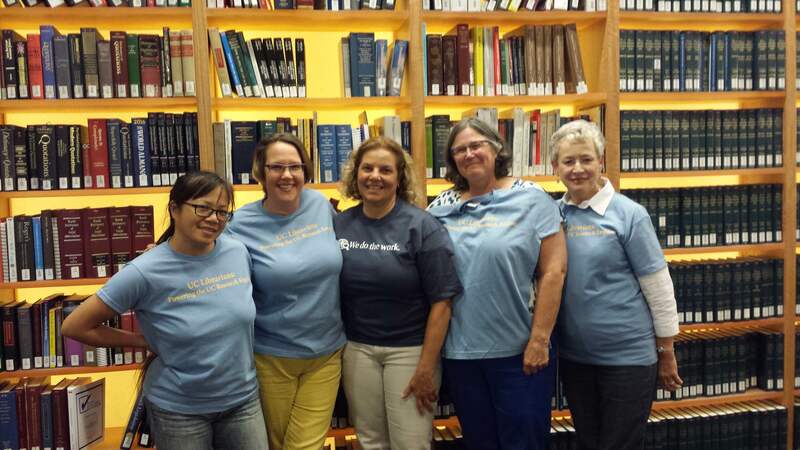 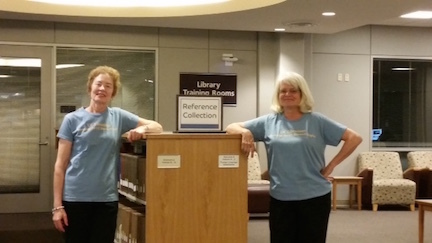 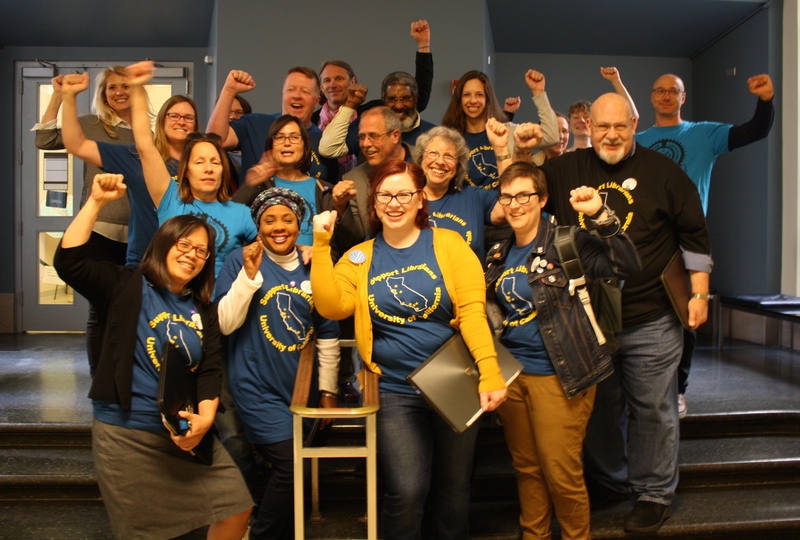 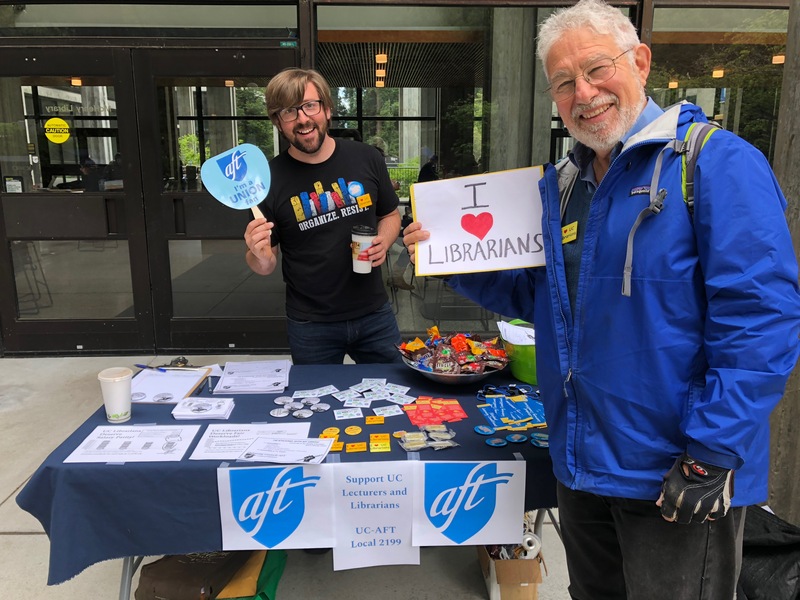 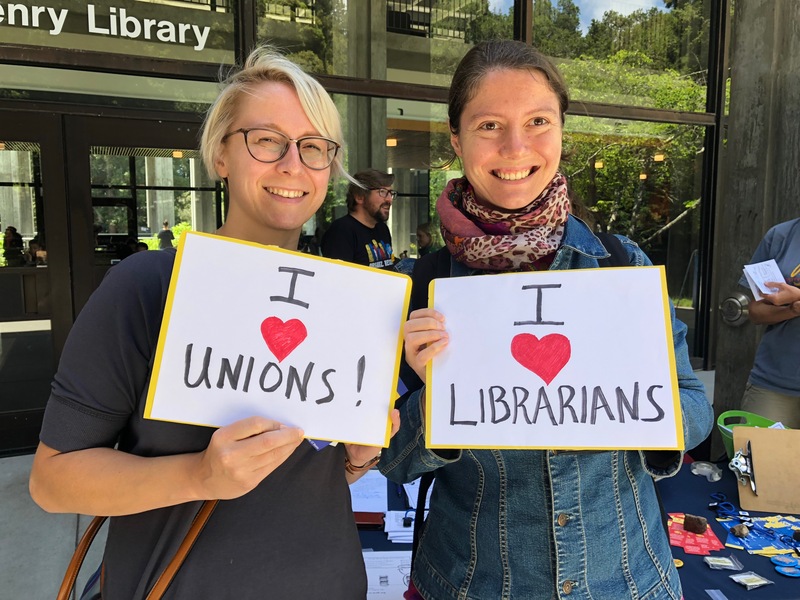 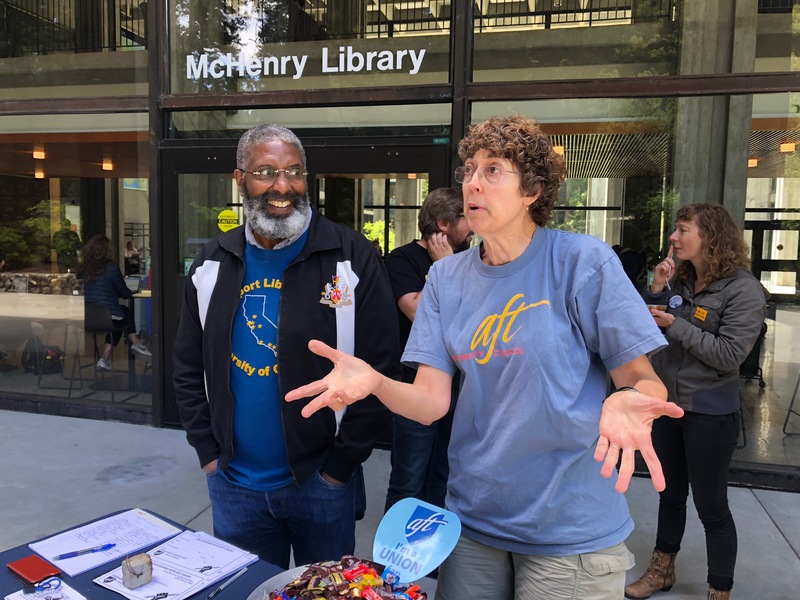 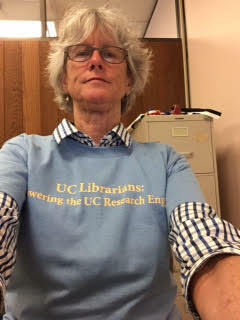 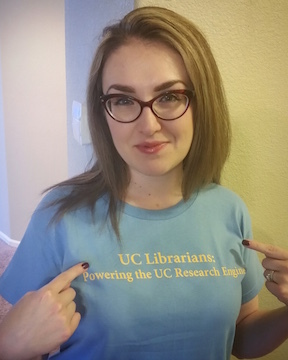 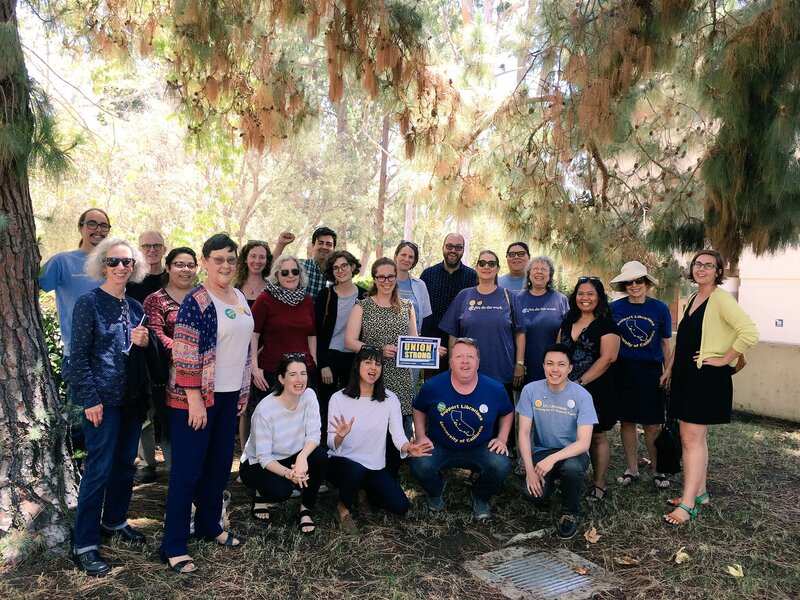 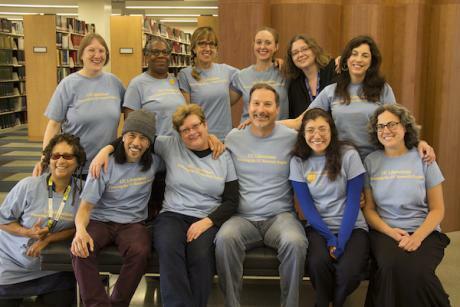 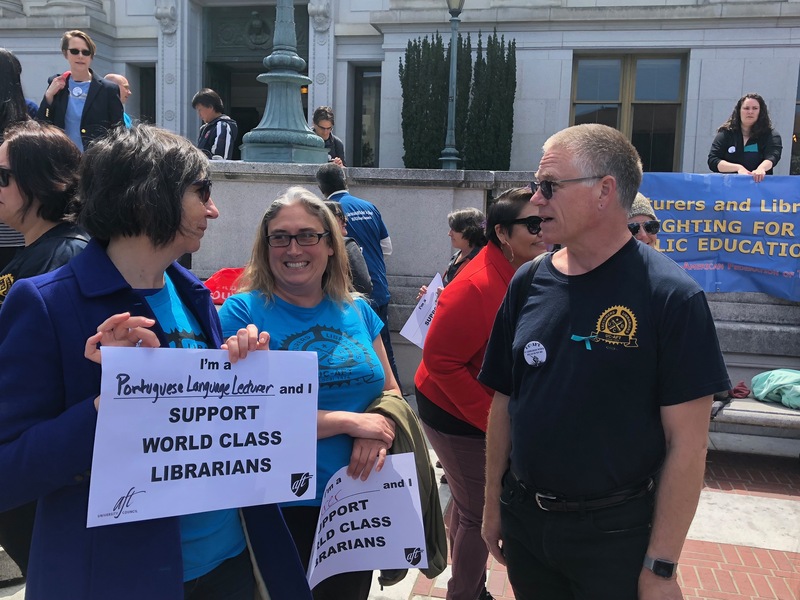 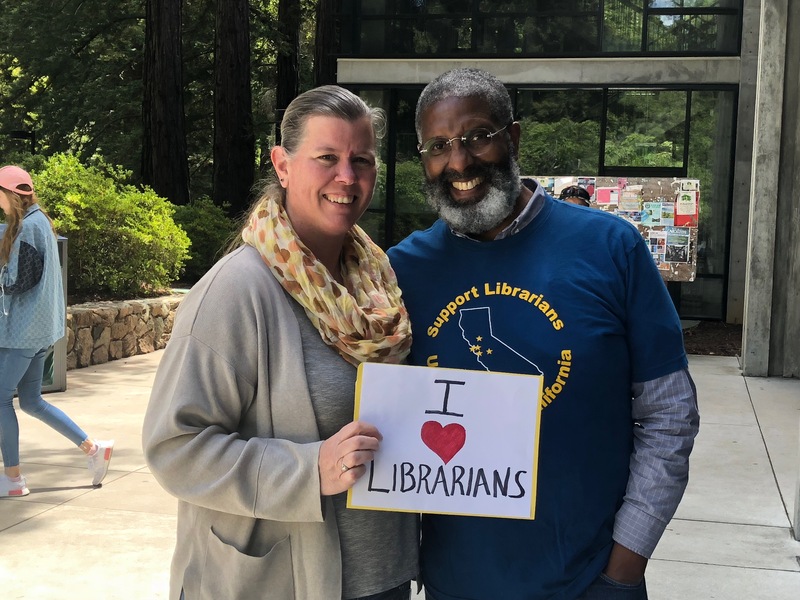 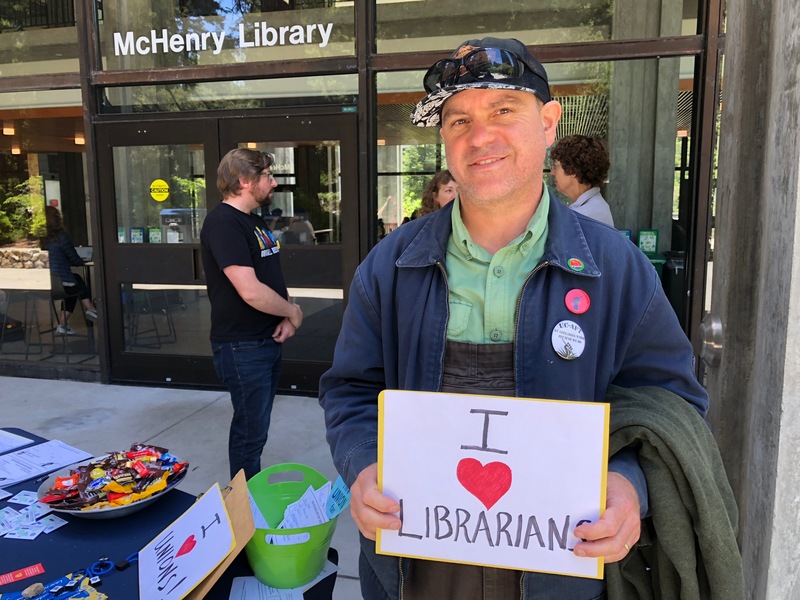 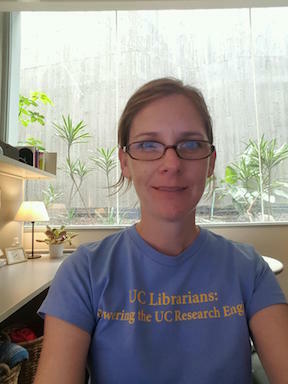 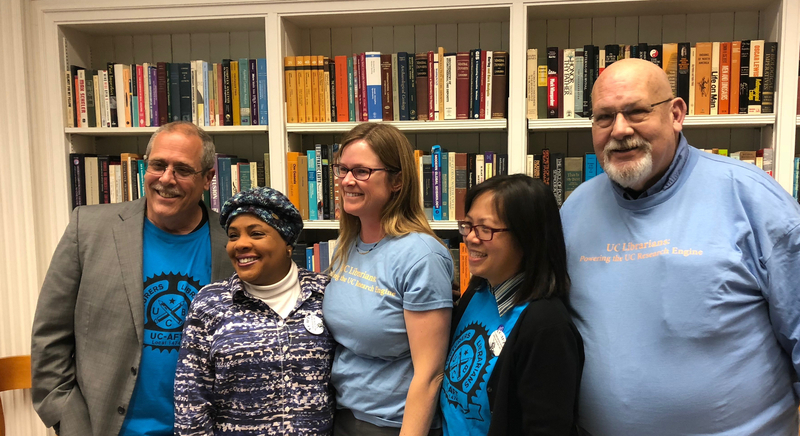 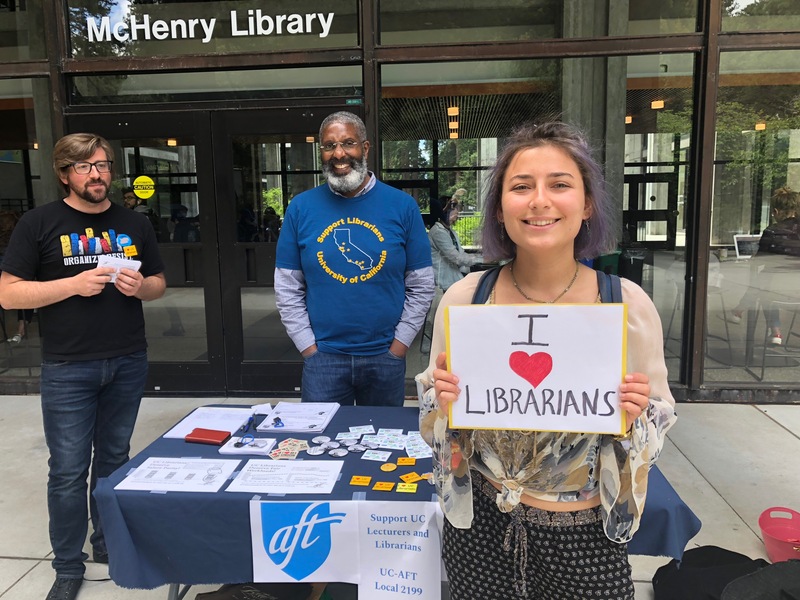 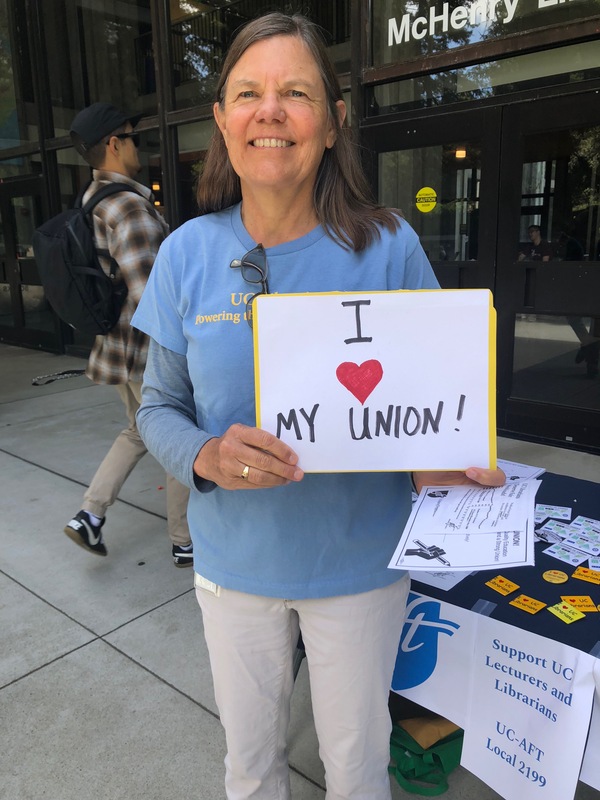 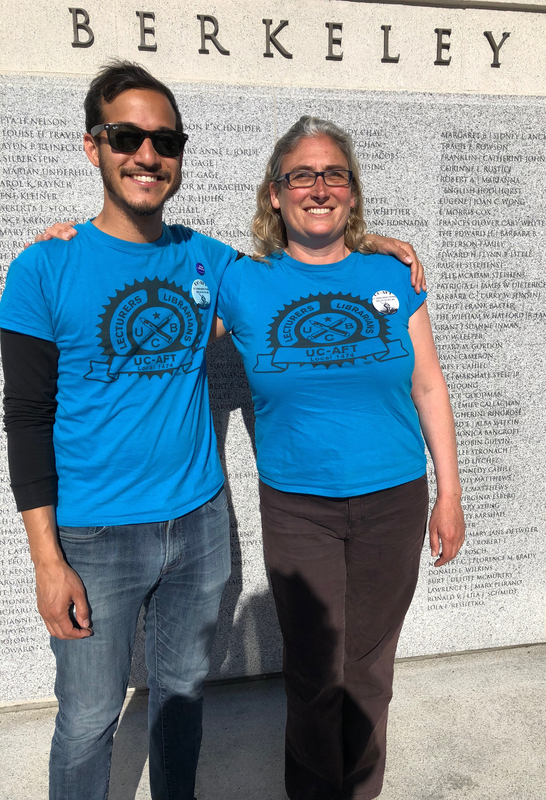 Librarians across the state wore t-shirts with the slogan “UC Librarians: Powering the UC Research Engine” in solidarity with our bargaining team. 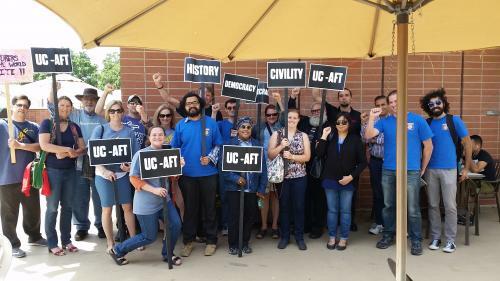 We arrived at 9:30am and were ready to begin bargaining with UCOP Labor Relations at 9:50am. 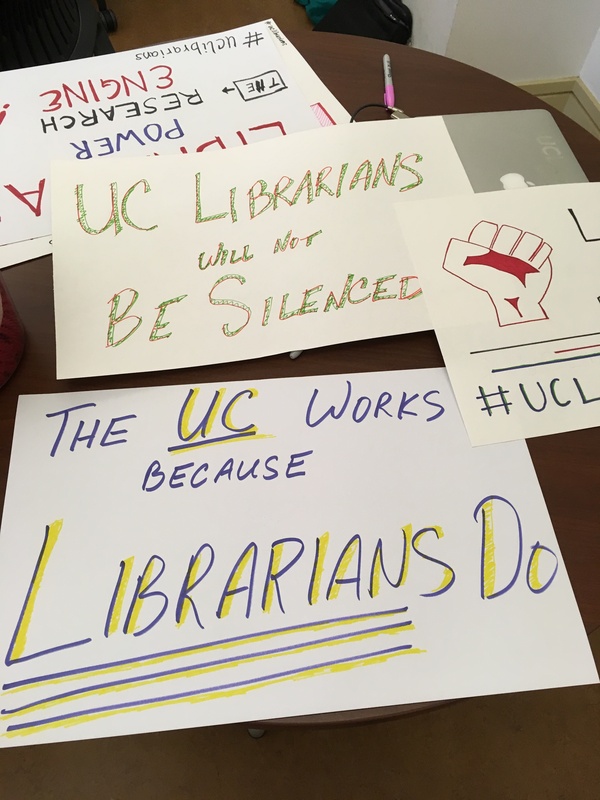 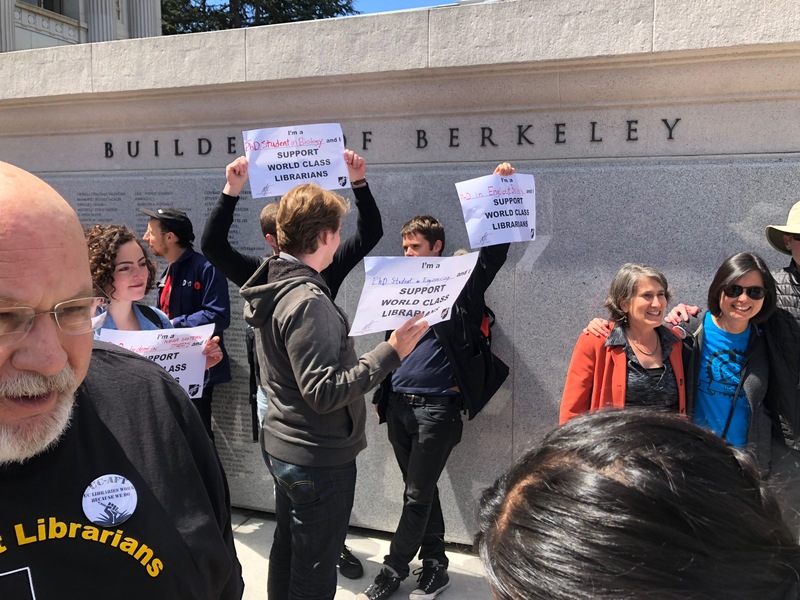 UC Chief Negotiator Peter Chester informed Axel Borg and Mitchell Brown that the University team needed time to prepare so we did not meet until 11:35am. 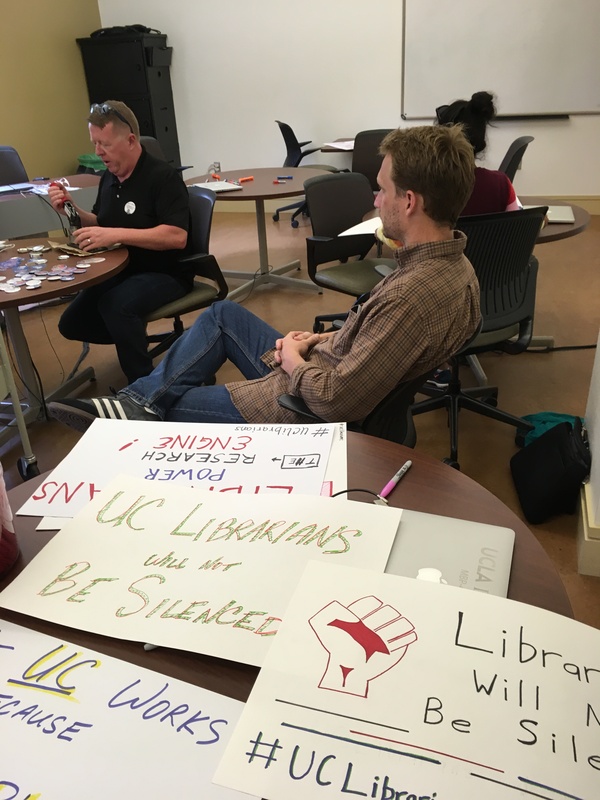 Peter also informed us that the University would only present data to give financial context to our proposals (Professional Development Funds and Salary) and would not be presenting an actual proposal. 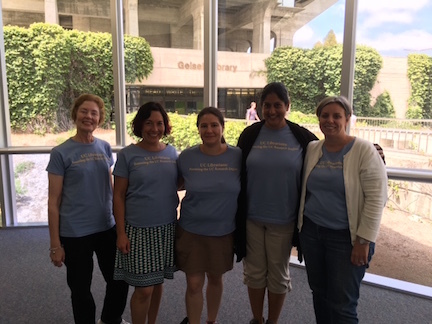 The University team presented data they had developed on what they determined it would cost to fund our Professional Development proposal. 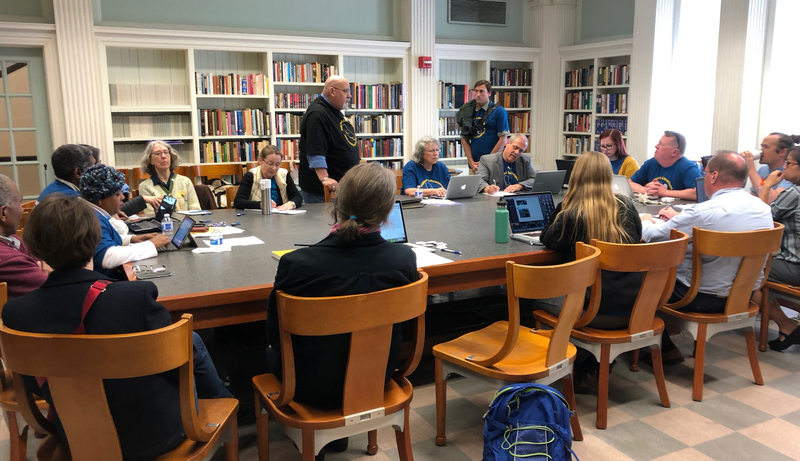 We then broke for lunch and reconvened later in the afternoon when the University presented data on the cost of merits as a counterbalance to our request for salary increases. 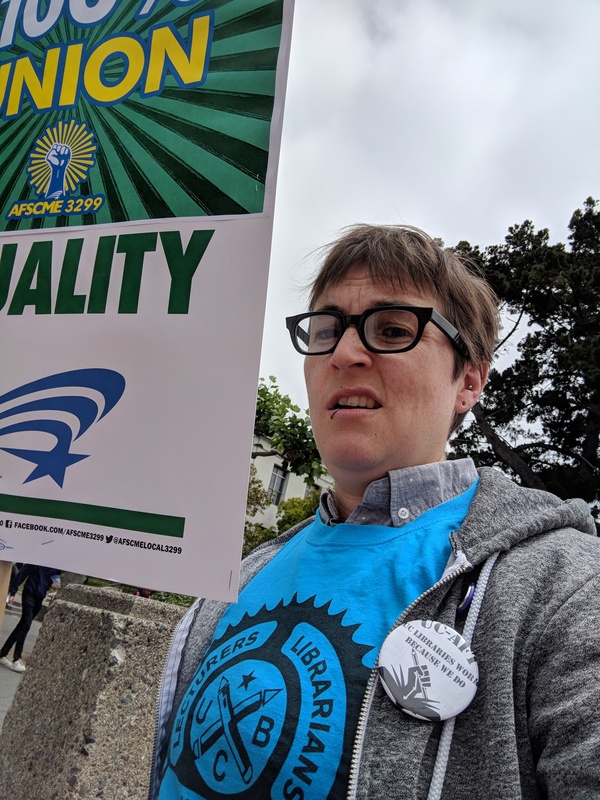 The good news is that the point system seems to be working in that it allows for more nuanced salary increases based on meritorious performance. 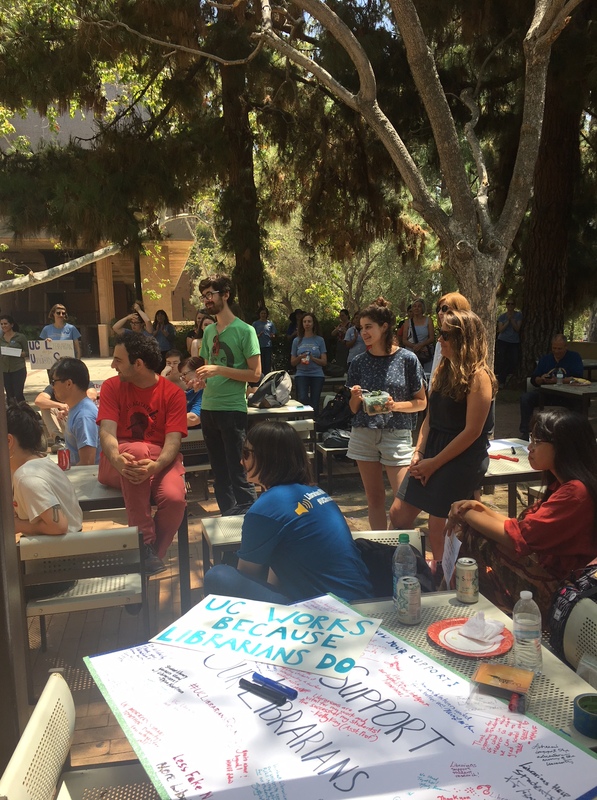 We then set two more bargaining dates, August 5 and 31, at which we hope to see concrete proposals from the University. 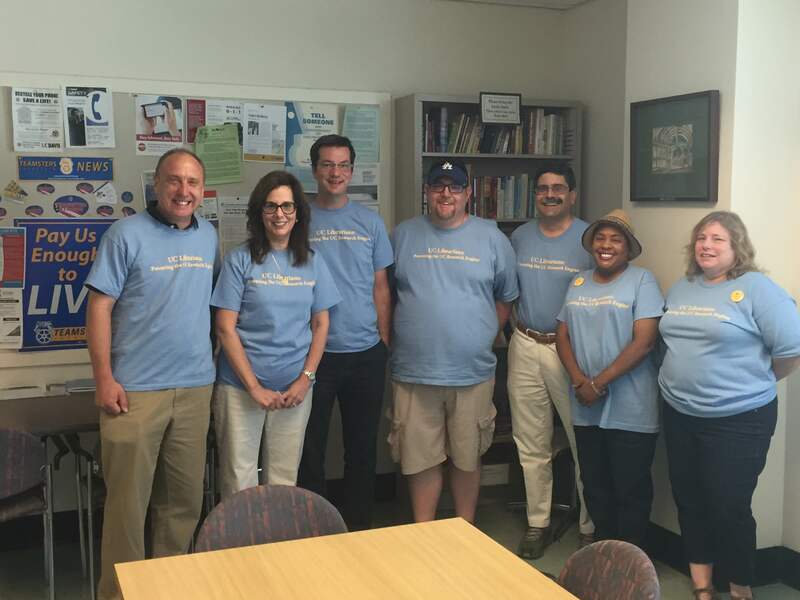 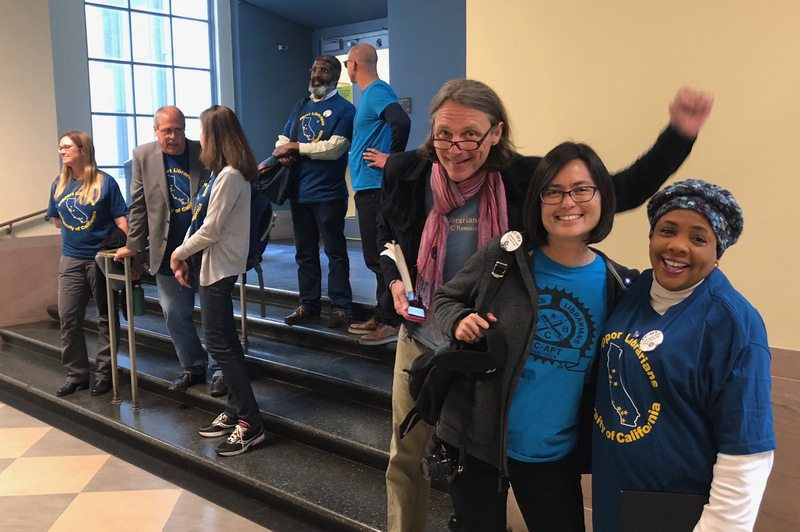 The Bargaining Team also wore t-shirts, which was commented upon by UC negotiators. 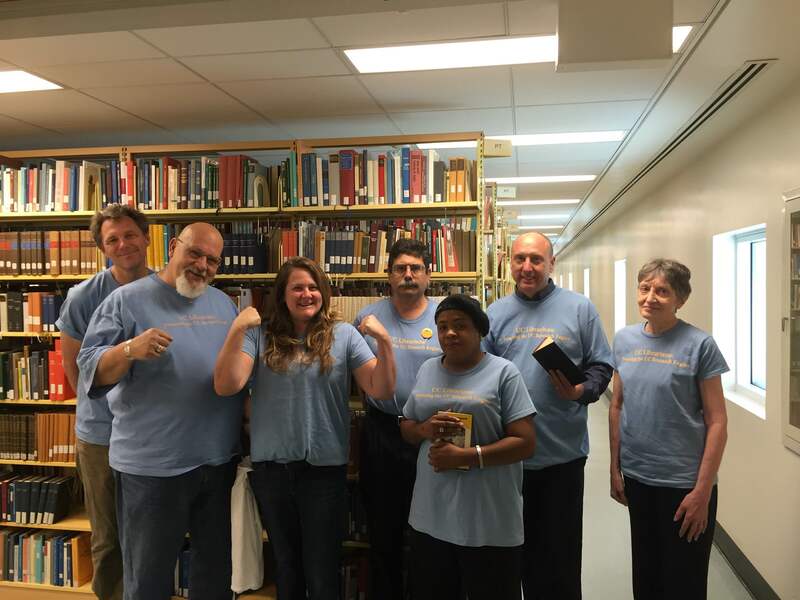 Our team was greatly encouraged by the photos taken of t-shirt actions on the various campuses. 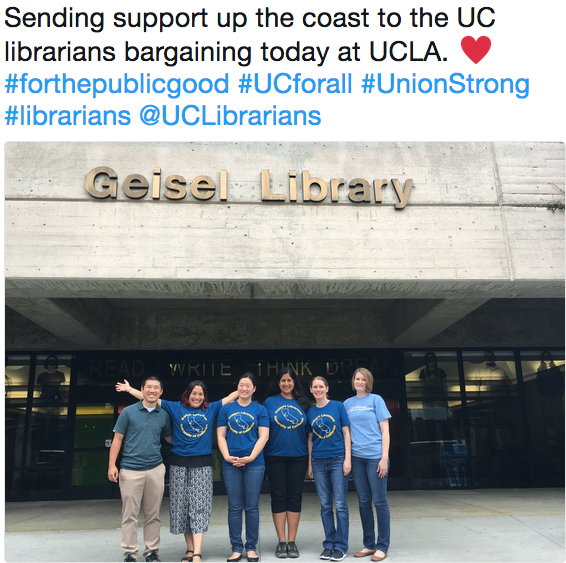 Posted on July 7, 2016 January 4, 2018 by Carla ArbageyPosted in 2016 re-opener bargainingTagged bargaining updates, events.